FOR our 22nd DATAFILE,the author and publishers have gathered together almost 100 photos which,along with a selection of contemporary sketches,represent one of the largest collection of Sopwith Triplane images ever assembled for a single publication to make this one of the most comprehensive titles among our early editions. 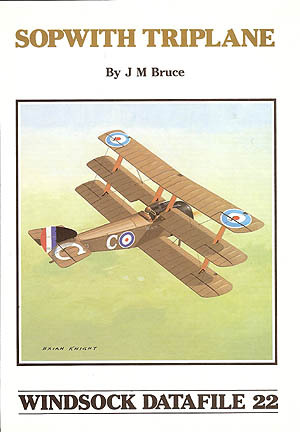 The classic fighter design from the Sopwith factory, the nimble triplane was the favourite of many WWI RNAS aces and is extensively documented in this superb book by Jack M Bruce. Contents includes 53 archive photos; 41 close-ups of the RAF Museum's unique twin gun example; five official handbook sketches; three pages of 1:48 and 1:72 scale general arrangement drawings by Ian Stair based on official factory blueprints;detailed colours and markings notes together with three rear cover profiles. An absolute must-have reference for builders of 1:32 scale Roden and Wingnut Wings model kits! More on the Sikorsky Veh with scale plans plus Shuttleworth's Sopwith Triplane in colour and a centrespread cutaway!British aeroplane fabrics,American volunteer pilot,flying scale models,kit reviews and more! Worn but complete copy.